Need more convincing? Download a PDF of Chapter 1, the Index, and the Table of Contents for free. Jeremy shows you how to use an Arduino to build electronic things with skill akin to a carpenter using a hammer to build a house. 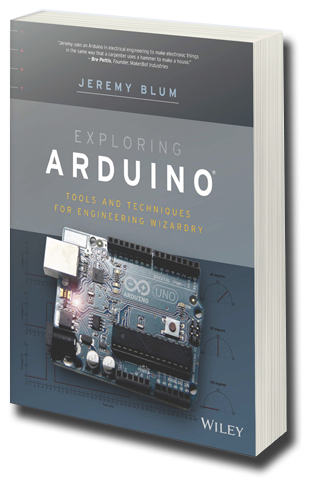 An excellent in-depth book that combines Arduino instruction and the science of electronics. Jeremy Blum is knowledgeable about the Arduino platform and a well-versed hardware hacker. Jeremy’s easy-to-understand style and depth of content about the Arduino translates well from his YouTube videos to this all-inclusive book. It will not only allow digital beginners to get their footing but will also allow the old guard of hardware to dip a toe into the hobbyist friendly end of the swimming pool and start connecting their devices.